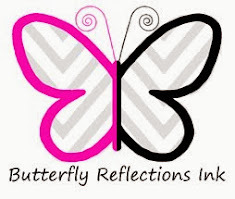 Hello and welcome back to the Butterfly Reflections blog! Gladys here and I'm back to share this holiday card for you. I used mostly Lawn Fawn products and added a few things here and there to make this simple and adorable scene. I first die cut white cardstock using the scallop frame from My Favorite Things. I then distressed it with chipped sapphire, faded jeans, shaded lilac and spun sugar. I stamped the images from two Lawn Fawn 2016 winter/fall stamp set: Snow Cool and Cheery Christmas. I colored them with copic markers and cut them using the coordinating dies. Then I heat embossed the sentiment from Merry Messages using silver embossing powder. I added foam tapes on the back of the die cuts for dimension. I wanted the critters to be standing/sitting on snow so I used my Uchida snow marker to add faux fur. If you haven't used this marker before I suggest you should. It's amazing and adds a real like texture. I have used it to add fur on critters or add texture to clothes. What I do is I pressed the marker down on a scratch piece of paper for the liquid to come out. Using the tip of the marker I dab the liquid onto my card and keep adding a little bit at a time. Then I used my heat tool until the liquid starts to puff up. Now you don't want to hold the heat tool on it too long because it will start to burn. I hope you give it a try! Lastly on my card I wanted to add some shimmer so I cut the scallop frame again from silver glitter cardstock. Thanks for stopping by till next time! Have a fabulous weekend!